In the late 1970s, a group of residential remains of the Yangshao Period were discovered at the Dadiwan site in Qin’an County, Gansu Province, China . One of these discoveries is named as “original palace” (number F-901) in the archaeological world, and is the largest and top leveled residential site in prehistoric times. This site belongs to the middle Yangshao Period and was used for convocation, worshiping and religious ceremonies by tribes or tribe allies over 5000 years ago. When it was discovered, the site had a bright and clean house floor that was of exquisite workmanship. Preliminary research  indicates that the housing floor of the site was made by lightweight calcined Kunkur as aggregate and the powder of calcined ginger nut mixed with a small amount of laterite as bonding materials. After more than five thousand years, the compressive resistance of the floor is close to that of cement mortar No.100. Moreover, the remains of kilns for burning light weight concrete and ginger nut were discovered nearby the site. The research shows that the calcinated temperature of ginger nut could reach up to 900°C . Ginger nut is a type of ginger stone (locally called as ginger nut) in quaternary loess and is composed of 60-80% calcium carbonate and 10-20% clay mineral. When ginger nut is calcinated at a temperature of 900°C, it will produce 25.8% β-CaSiO3, 17.6% Ca2Al2SiO7 and 33.9% CaO. β-CaSiO3 and Ca2Al2SiO7 are hydraulic binding materials, and CaO is a non-hydraulic binding material . Therefore, the building materials of F-901 floor in which manmade hydraulic binding materials had been used can be called as the earliest “concrete” in the world, which is a miracle in the history of architecture . Aga soil is another kind of silicate building material widely used in Tibet, and it is the siliceous limestone  that contains 70 ~ 93% CaCO3 and 7 ~ 30% SiO2. When Aga soil is used as building material for floor and house (roof), the unburned Aga soil with 40% in a diameter of 5.6 mm, 30% in a diameter of 2.6 mm and 30% 0.15 mm diameter will be made to pulp at the ratio of 0.32 water and then is rammed by a special stone pester. Until the grout completely becomes solid, it will be sanded first and then repeatedly polished with sheepskin and butter. This technique is called “ramming Aga” , and for centuries, this traditional material and building technology have been used to construct floors and roofs of temples in Tibet. In Tibet, there are over one thousand temples that are very valuable cultural relics, such as the well-known Potala Palace, Norbulingka Summer Palace and Sakya Monastery. The Chinese government attaches great importance to the conservation of Tibetan cultural relics. In the last two decades, two large projects for the conservation and restoration of key relics including the Potala Palace and Sakya Monastery have been carried out [5, 7]. The restoration work focuses on ancient buildings and murals, and the main kinds of deterioration are associated with Aga soil used in the roofs. In Tibetan, traditional materials for the roofs of the temple are unburned Aga soil that was crushed into the powder of 0.15 mm in diameters as “gelation” and it was mixed with proper amount of natural gum  to make mortar. But unburned Aga soil has low strength and poor weathering resistance but the property of chemical gelatinization. Influenced by the freezing and thawing cycles and the fluctuating temperature and humidity, the natural gum will quickly deteriorate and break. When the rain infiltrated through the cracks, wooden components will decay, fall apart or become leaning, causing subsequent deterioration, such as detachment, large-area loss, disruption and flaking, and thus terribly damaging the murals . Therefore, the research and scientific modification of the two silicate materials in ancient Chinese buildings is very important for the restoration of stone, brick and pottery relics as well as the conservation of ancient Tibetan buildings and murals. The density and saturated water absorptivity of natural ginger nut and Aga soil were tested, and the samples in the size of 5 cm × 5 cm × 5 cm were made for the test of compressive strength (Table 1). X-fluorescence was used to analyze the chemical compositions of ginger nut and Aga soil (Table 2). XRD was used to analyze the mineral composition of ginger nut and Aga soil (Table 3). When ginger nut and Aga soil are calcined at a high temperature, both the hydraulic material CaO and nonhydraulic material β-CaSiO3 and Ca2Al2SiO7 will be produced. And the calcination temperature directly affects the ratio of two kinds of the binding materials (Figures 1 and 2). XRD spectra of ginger nut calcined at 700°C ~1400°C and comparison of products (1-CaCO 3 ;2-SiO 2 ;3-CaO;4-β-CaSiO 3 ;5- Ca 2 Al 2 SiO 7 ). 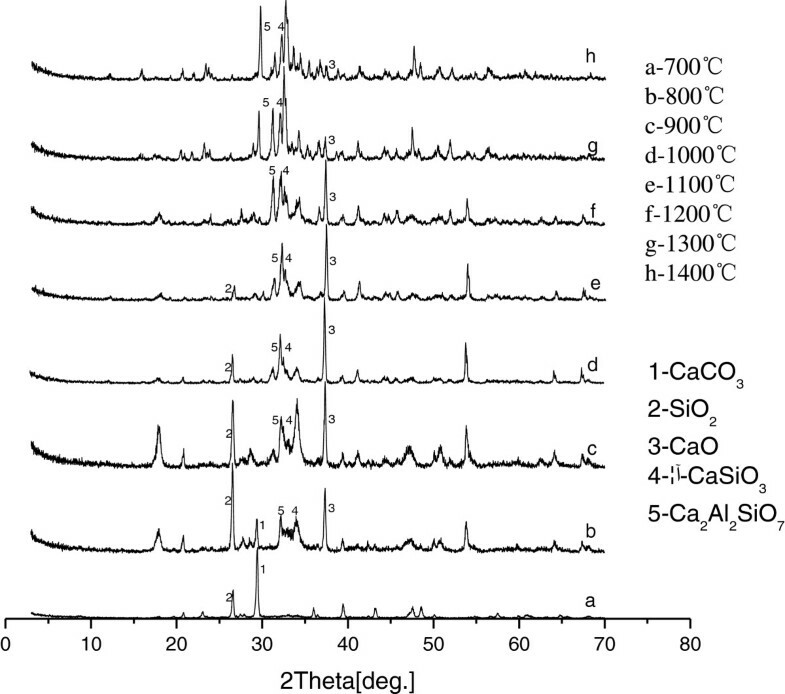 X-RD spectra of Aga soil calcined at 700°C ~1400°C and comparison of products (1-CaCO 3 ;2-SiO 2 ;3-CaO;4-β-CaSiO 3 ;5- Ca 2 Al 2 SiO 7 ). A semi-quantitative analysis had been done to the main products CaO, β-CaSiO3 and Ca2Al2SiO7 in Ginger nut and Aga soil at different temperatures, and the curve lines showing how the products varied with temperature were made by comparing the analysis results (Figures 3 and 4). Change trend plots of the main products of ginger nut calcined at 700°C ~1400°C for 3 hours. Change trend plots of the main products of Aga soil calcined at 700°C ~1400°C for 3 hours. Figures 1-4 indicate that at 700°C ginger nut produces 7.3% β-CaSiO3 and 5.2% Ca2Al2SiO7 with no CaO produced, and it produces 17.2% CaO, 24.7% β-CaSiO3 and 16.3% Ca2Al2SiO7 at 800°C. When the temperature rises from 800°C to 1100°C, the generating speed of CaO is obviously fast and it reaches up to the maximum 42.1%, and this is the best temperature to produce CaO. But the generating speed of β-CaSiO3 increases less obviously from 24.7% to 28.4% and the speed of Ca2Al2SiO7 from 16.3% to 19.15% is much less boviously. Thus this temperature range is not helpful for the generation of β-CaSiO3 and Ca2Al2SiO7. When the temperature rises from 1100°C to 1400°C, the amount of CaO quickly drops from 42.1% to 16.7% because CaO takes part in the reaction to produce β-CaSiO3 and Ca2Al2SiO7. 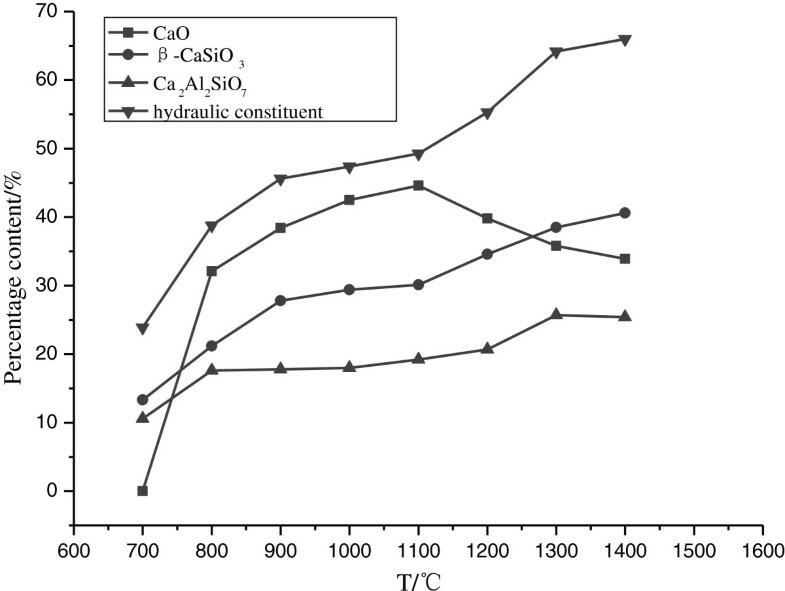 While β-CaSiO3 and Ca2Al2SiO7 are generated more quickly: β-CaSiO3 increases from 28.4% to 47.7% and Ca2Al2SiO7 increases from 19.1% to 35.5%. The condition of calcined Aga soil is similar to calcined ginger nut. At 700°C ginger nut produces 13.3% β-CaSiO3 and 10.6% Ca2Al2SiO7 with no CaO produced. At 800°C, it produces 32.1% CaO, two times of that produced by ginger nut at the same temperature. The main reason is that Aga soil has a larger amount of CaCO3 than ginger nut and has half amount of SiO2 compared with ginger nut, which is useful for producing CaO. At the temperature ranges from 800°C to 1100°C and from 1100°C to 1400°C, CaO decreases in amount from 44.6% to 33.9%, but not so obviously as ginger nut. The speed of producing β-CaSiO3 and Ca2Al2SiO7 increases, but it is not so quickly as ginger nut. β-CaSiO3 increases from 30.1% to 40.6% and Ca2Al2SiO7 increases from 19.2% to 25.4%. The reason is the same as stated above that Aga soil has less amount of SiO2 and larger amount of CaCO3 than ginger nut. XRD and SEM were used to analyze ginger nut and Aga soil calcined for three hours at 1000°C and then analyze and study the process of their hydration and carbonization. 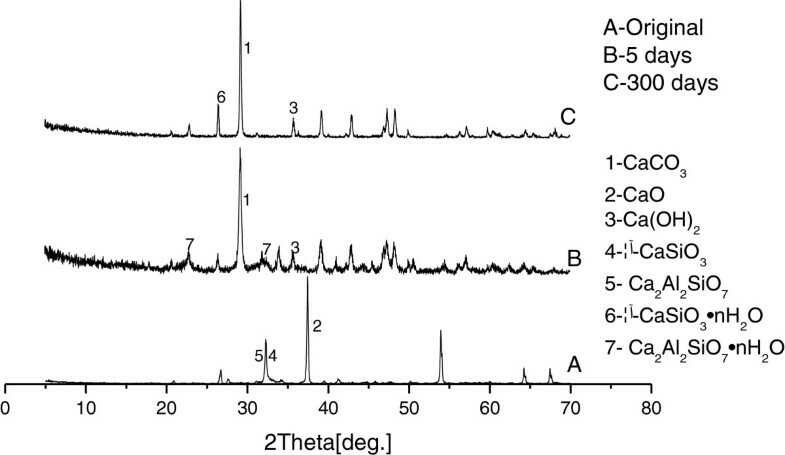 Figures 5 and 6 are XRD spectra of calcined ginger nut and Aga soil at 1000°C together with their products of hydration and carbonization. 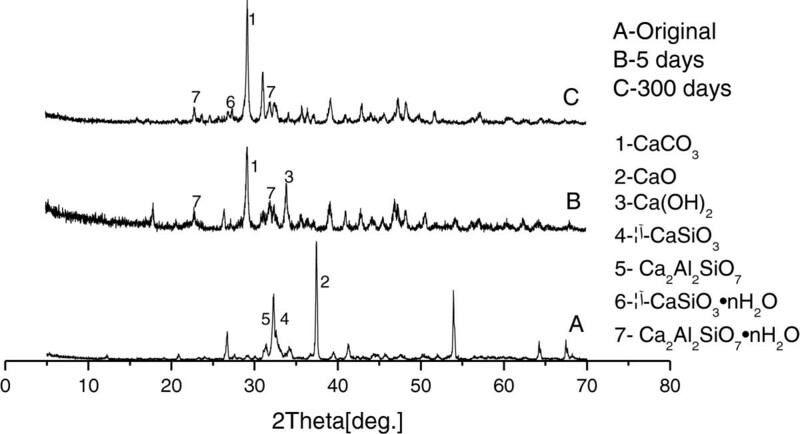 Comparative XRD spectra of calcined ginger nut at 1000°C after 5 days’ hydration and 300 days’ hydration (1-CaCO 3 ;2-CaO;3-Ca(OH) 2 ;4-β-CaSiO 3 ;5- Ca 2 Al 2 SiO 7 ;6-β-CaSiO 3 · nH 2 O;7- Ca 2 Al 2 SiO 7 •nH 2 O). Comparative XRD spectra of calcined Aga soil at 1000°C after 5 day’ hydration and 300 days’ hydration (1-CaCO 3 ;2-CaO;3-Ca(OH) 2 ;4-β-CaSiO 3 ;5- Ca 2 Al 2 SiO 7 ;6-β-CaSiO 3 · nH 2 O;7- Ca 2 Al 2 SiO 7 •nH 2 O). The results of XRD analysis shows the ginger nut calcined for three hours at 1000°C includes 39.20% CaO, 26.70% β-CaSiO3 and 18.90% Ca2Al2SiO7 before hydration (Figure 5A). When hydrated in a relative humidity of 80%, it will produce 32.6% CaCO3, 22.7% Ca(OH)2 and 21.6% Ca2Al2SiO7•nH2O (Figure 5B) after five days. 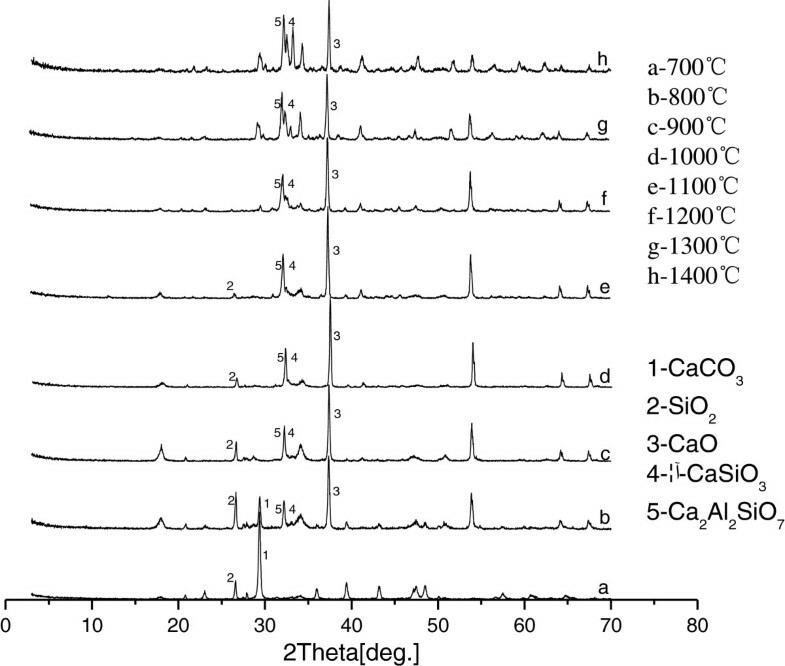 After 300 days, it will produce 86.2% CaCO3 and 3.2% Ca2Al2SiO7•nH2O (Figure 5C) on the surface of samples, and at the depth of 2-3 mm of the samples it produces 54.6% CaCO3, 2.1% Ca(OH)2, 22.6% CaSiO3•nH2O and 13.2% Ca2Al2SiO7•nH2O. When Aga soil is burned for three hours at 1000°C, it will produce 42.50% CaO, 29.40% β-CaSiO3 and 18.00% Ca2Al2SiO7 (Figure 6A). Hydrated in 80% relative humidity, it will produce 47.6% CaCO3, 13.1% Ca(OH)2 and16.7% Ca2Al2SiO7•nH2O (Figure 6B) after five days. 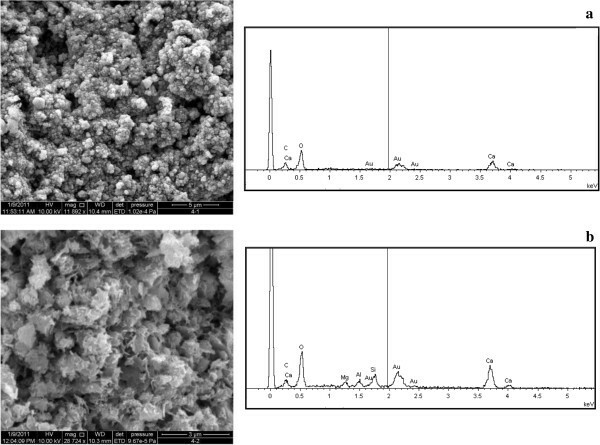 Three hundred days later, on the surface of the samples is produced 74.2% CaCO3, and at the depth of 2-3 mm produced 48.4% CaCO3, 24.6% Ca(OH)2, 5.3% β-CaSiO3 · nH2O. XRD semi-quantitative analysis verifies that after being calcined for three hours at 1000°C, ginger nut and Aga soil a 80% relative humidity have large speeds of hydration and carbonization. Five days later, they respectively produce 32.6% and 47.6% CaCO3, 22.7% and 13.1% Ca(OH)2 and 21.6% and 16.7% Ca2Al2SiO7•nH2O. Three hundred days later, calcined ginger nut and Aga soil samples have a 3 mm depth of carbonized layer and produce 86.2% and 74.2% CaCO3 respectively. At 3 mm depth, it generates 54.6% and 48.4% CaCO3. Calcined ginger nut is carbonized more quickly than Aga soil. 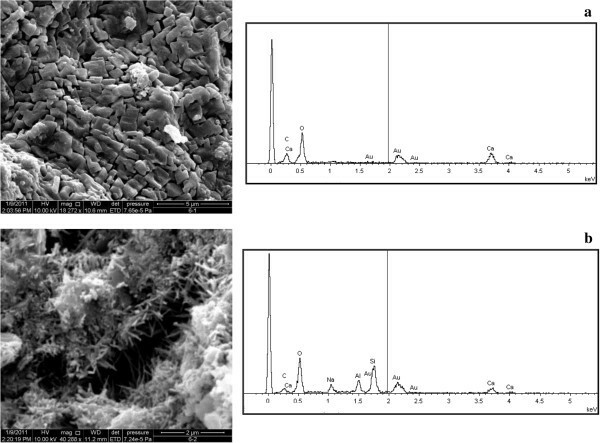 Figures 7 to 11 are SEM photos and EDS spectra of burned ginger nut and Aga soil and their products of hydration and carbonization. SEM photos and EDS spectra of ginger nut and Aga soil calcined in 1000°C. a. The fine crystal aggregate of calcium oxide, calcium silicate and aluminum calcium silicate in calcined ginger nut. b. The fine crystal aggregate of calcium oxide, calcium silicate and aluminum calcium silicate in calcined Aga soil. SEM photos and EDS spectra of ginger calcined in 1000°C after hydration and carbonization for five days. a. The forming of minor calcium carbonate re-crystalline on the surface, and the aggregate with calcium silicate and aluminum calcium silicate crystal. b. The forming of minor hydrated calcium silicate in the deep layer, and the crystal of hydrated aluminum calcium silicate covering big quartz particles. SEM photos and EDS spectra of ginger calcined in 1000°C after hydration and carbonization for 300 days. a. The forming of a large number of compact calcium carbonate re-crystalline on the surface; b. The forming of minor calcium carbonate re-crystalline and a large number of hydrated calcium silicate and hydrated aluminum calcium silicate crystal in the deep layer. SEM photos and EDS spectra of Aga soil calcined in 1000°C after hydration and carbonization for five days. a. The forming of minor calcium carbonate re-crystalline on the surface. b. The forming of minor calcium carbonate re-crystalline, calcium silicate and aluminum calcium silicate hydrate crystal in deep layer. SEM photos and EDS spectra of Aga soil calcined in 1000°C after hydration and carbonization for 300 days. a. The forming of a large number of calcium carbonate re-crystalline on the surface. b. The forming of minor calcium carbonate re-crystalline, and a large number of hydrated calcium silicate and hydrated aluminum calcium silicate crystal in the deep layer. 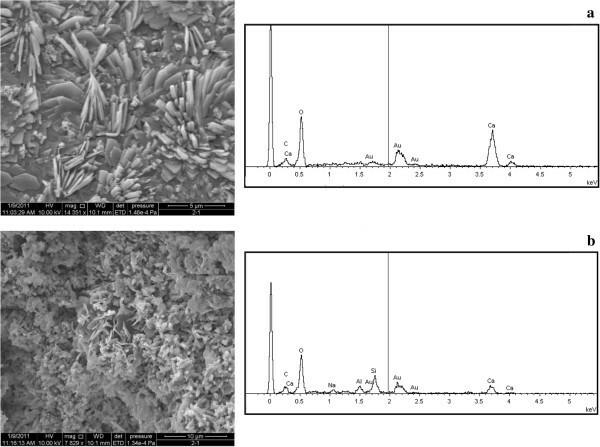 SEM photos show that ginger nut and Aga soil calcined for three hours at 1000°C produce fine crystal aggregates of CaO, β-CaSiO3 and Ca2Al2SiO7 (Figure 7a and b). Five days later after hydration, the sample of calcined ginger nut produces little re-crystals CaCO3 and crystal aggregates β-CaSiO3 and Ca2Al2SiO7. On the surface of calcined Aga soil, re-crystals CaCO3 is produced (Figures 8a and 10a). and at the deep layer, the calcined ginger nut produces little crystals β-CaSiO3 · nH2O and Ca2Al2SiO7•nH2O encircled by large quartz particles. The deep layer of Aga sample produces little re-crystals CaCO3, crystals β-CaSiO3 · nH2O and Ca2Al2SiO7•nH2O (Figures 8b and 10b). 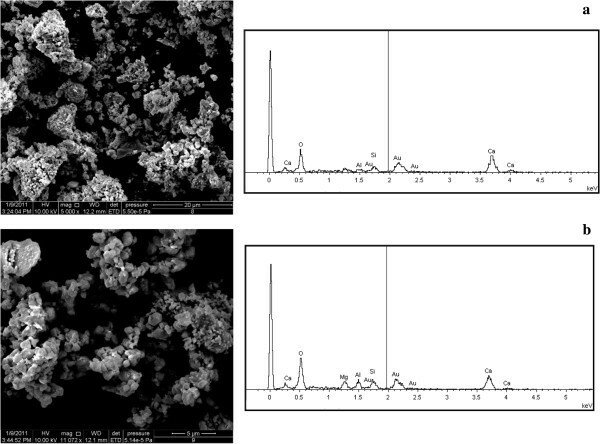 Three hundred days later after hydration, both of calcined ginger nut and Aga soil on the surface form a lot of compact re-crystals CaCO3 (Figures 9a and 11a), and at their deep level it forms little re-crystals CaCO3 and a lot of crystals β-CaSiO3 · nH2O and Ca2Al2SiO7•nH2O (Figures 9b and 11b). Moreover, in the process of hydration Ca(OH)2 will be produced, and it will gradually adsorb CO2 generate CaCO3. More than five thousand years ago in China, calcined ginger nut had been used as building material for building floors during the Yangshao Period. In Tibet, Aga soil had been used as a building material of temple floors and roofs for over one thousand years. Ginger nut can be also called clay limestone and Aga soil called silicious limestone. The contents of clay and SiO2 in ginger nut and Aga soil differ from those from different regions. But whatever the contents of clay and SiO2 in them, the raw ginger nut and Aga soil will not produce the binding materials and are not suitable for being used as building materials without being calcined. The percentages of silicon and clay in ginger nut and Aga soil decide the contents of non-hydraulicity and hydraulicity in the binding materials produced by high temperature calcination and also influence the properties of ginger nut and Aga soil calcined at different temperatures. The above research proves that ginger nut from Qin’an Dadiwan of Gansu and Aga soil from Shan’nan in Tibet are calcined for three hours at eight temperatures from 700°C to 1400°C, and their products non-hydraulic material CaO and hydraulic materials β-CaSiO3 and Ca2Al2SiO7 change regularly in ratio. Their properties differ slightly because of their different ratios. For example, if there are much larger hydraulic components, the strength of materials grows faster at early stage and it will combine with the body of cultural relics repaired. But the main defect is the low porosity of cementitious materials formed, thus the material show bad air and water permeabilities. Influenced by temperature and humidity, the repairing materials will detach from the body of the restored relics in a short period (generally 3 to 5 years). So this material has bad durability. If the non-hydraulic components increase a little more, the strength of materials will grow slowly, and the repairing material can’t combine with the relics in a short time and thus affect the results of restoration. Calcined ginger nut and Aga soil have a key characteristic in repairing stone relics, namely CaO will combine with water to generate gel Ca(OH)2, which then reacts with CO2 and H2O in the air to gradually produce large porosity gel CaCO3. This process is called self-repairing effect of hydraulic limestone [8–14] by European scholars. Although the carbonization of non-hydraulic constitute is slow, the whole process of carbonization begins from the surface and extends in depth. When relative humidity in the environment is 80%, the hydration and carbonization will be fast on the surface and then become slowly in the depth because CO2 is much less. Just because of this, CaCO3, the gel with big porosity and good water permeability, will be produced during the slow carbonization process. 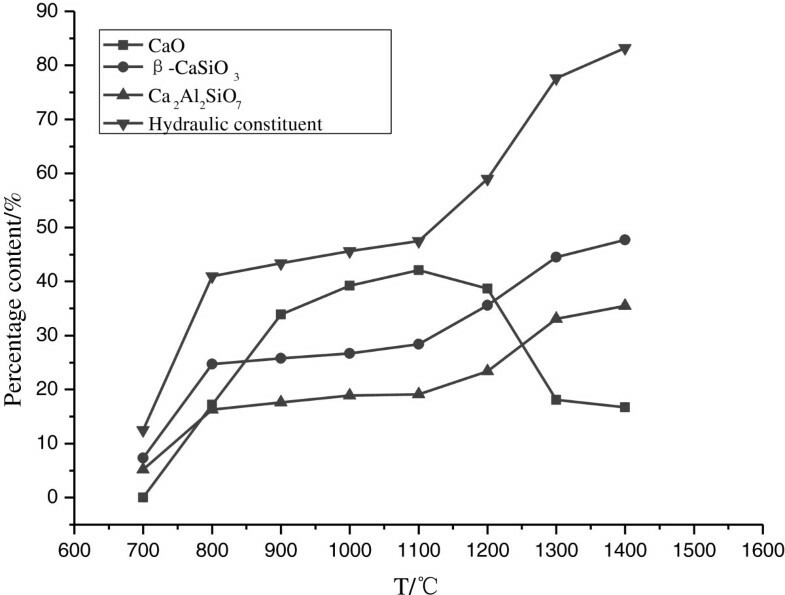 The CaCO3 produced from fast carbonization on the surface is complementary to the strength of the β-CaSiO3 · nH2O and Ca2Al2SiO7•nH2O produced from fast hydration of hydraulic constitute sand therefore can meet the requirements for relics restoration. Then the gradual carbonization of this gel will make it tightly combined with the relics, creating good weathering resistance. Conservators in Europe had found the advantages of the binding material (hydraulic lime) calcined by clay limestone and siliceous limestone in the restoration of stone relics. In 1970s, they had used binding materials similar to Chinese ancient calcined ginger nut in the restoration of stone relics and obtained good conservation results [15–23]. They pointed out that hydraulic lime stone “has specific usefulness that can’t be replaced by concrete and non-hydraulic limestone particularly in the restoration of ancient or old buildings” . Calcined ginger nut had been used as the biding materials in the building floors of the Dadiwan site in Gansu Qin’an during the Yangshao Period. No matter what percentage of CaO, β-CaSiO3 and Ca2Al2SiO7 was in calcined ginger nut, for thousands of years, the site of housing was buried under loess of farm land of hillside. 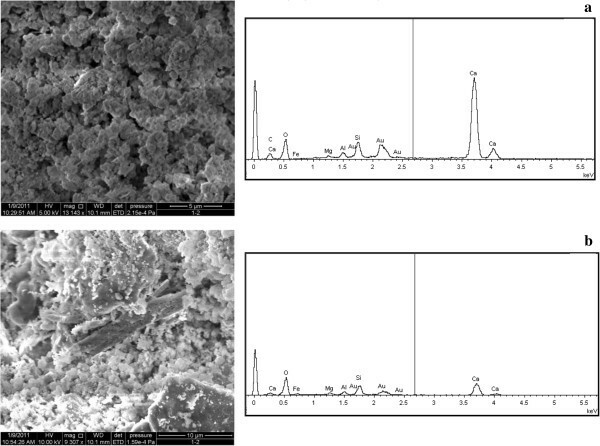 Non-hydraulic and hydraulic materials mainly changed into porous CaCO3 through their interaction with CO2 and H2O. So after more than five thousand years, F-901 floor material at Dadiwan is similar to modern No. 100 cement mortar floor in compressive strength. However for centuries, the Aga soil used in Tibetan building floors and roofs was never burned at high temperature. This material didn’t include non-hydraulic binding material and hydraulic material, thus this building material had low strength and poor weathering resistance. The roofs of temples have to be restored once in three to five years, not only involving a lot of work and time, and but also increasing cost and damages. Preliminary tests demonstrate the floor and roof material added with powder of 30% calcined Aga soil as binding material can obviously improve the strength and weathering resistance of materials. By controlling the calcining temperature and selecting ginger nut and Aga soil with proper amounts of clay and SiO2, binding materials which contain non-hydraulic material CaO and hydraulic materials β-CaSiO3 and Ca2Al2SiO7 in various ratios can be made. The ginger nut from Qin’an in Gansu will produce about 39.2% CaO, 45.6% β-CaSiO3 and Ca2Al2SiO7 if calcined for three hours at 1000°C, while the Aga soil in Tibetan Shan’nan will produce about 42.5% CaO, 47.4% β-CaSiO3 and Ca2Al2SiO7 after being calcined for three hours at 1000°C. As calcining temperature rises (700°C~1400°C), non-hydraulic constitutes will reach the peak point at 1100°C and then drop to the bottom point at 1400°C, and hydraulic constitutes will keep rising to the peak point at 1400°C. Calcined ginger nut and Aga soil in the environment of 80% relative humidity have a faster speed of hydration and carbonization. After five days’ hydration, calcined ginger nut will produce 32.6% CaCO3 and 21.6% Ca2Al2SiO7•nH2O;while calcined Aga soil will produces 47.6% CaCO3 and 16.7% Ca2Al2SiO7•nH2O. Three hundred days later after hydration and carbonization, the thickness of carbonization on sample surface reaches 3 mm with 80% CaCO3 produced. Even under the depth of 3 mm, it also produces 50% CaCO3, 34% β-CaSiO3 · nH2O and Ca2Al2SiO7 · nH2O. Controling the ratio of non-hydraulic constitutes CaO, hydraulic constitutes β-CaSiO3 and Ca2Al2SiO7 in binding materials can not only adjust its early strength but also form the calculus of large porosity, good weathering resistance and high strength in the process of slow ‘carbonization’ that will firmly integrate with the stone relics and meet the requirements of conservation and consolidation of cultural relics. The work presented here was carried out in collaboration between all authors. LZ and ZL defined the research theme. LZ, ZL , LL and WJ designed methods and experiments, carried out the laboratory experiments, analyzed the data, interpreted the results and wrote the paper. All authors have contributed to, seen and approved the manuscript.